Click this to bring up the drop-down list of all the available tags. Click on a tag to start filtering your Trail. Once the Trail has reloaded, you can click on another if you need to filter even further. You can also filter by "Untagged Tasks" - this will bring up any tasks that don't have tags assigned to them. Trail remembers tags you add to an account on each device, allowing you to assign different devices to different teams. At any point you can revert back to the full Trail. 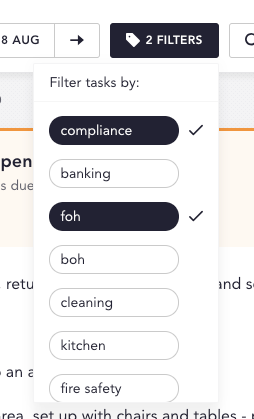 All you need to do is either deselect the tags in the drop-down, or you can click on the text that says "Show hidden tasks" at the bottom of the "Now" section. If you don't see the tags or filters you need, feel free to drop us a note or get in touch with your manager to update the tasks. If you'd like to read more on tags and filtering tasks on Trail, check out this blog post here.